Mayor Eddie DeLoach (center) presents proclamation to the Comcast delegation. Comcast hosted a series of events across Savannah last week designed to put a spotlight on the urgent need to bring more Internet service and digital skills into the lives of local low-income families, students and veterans. Comcast announced it has connected more than six million low-income Americans to the Internet through its Internet Essentials program, which is the largest and most comprehensive highspeed Internet adoption program for low-income families in the U.S. This number includes nearly 350,000 residents across the state of Georgia. The company also announced it will again expand eligibility – for the eleventh time – to low-income veterans, including more than 28,000 low-income veterans in the state of Georgia and one million nationally. According to the United States Census Bureau’s 2016 American Community Survey, less than 70 percent of low-income veterans have Internet access, and only about 60 percent own a computer. “This program has had an enormous impact on millions of families and children who now have high-speed Internet at home, most for the first time in their lives,” said David L. Cohen, Senior Executive Vice President and Chief Diversity Officer, Comcast Corporation. Cohen also announced the expansion of the Internet Essentials program to low-income veterans in Georgia at a military appreciation barbecue at the veteran-owned Service Brewing Co. The audience will included local veterans, key military leaders, elected officials, and community leaders. Comcast will also provide a grant to Savannah Technical College to support training for veterans pursuing civilian careers, with a focus on avionics. In addition, Comcast held a digital literacy assembly at Butler Elementary School where the company made a surprise donation of 100 laptops to fifth and sixth grade students from Butler Elementary School, Mercer Middle School and Myers Middle School. 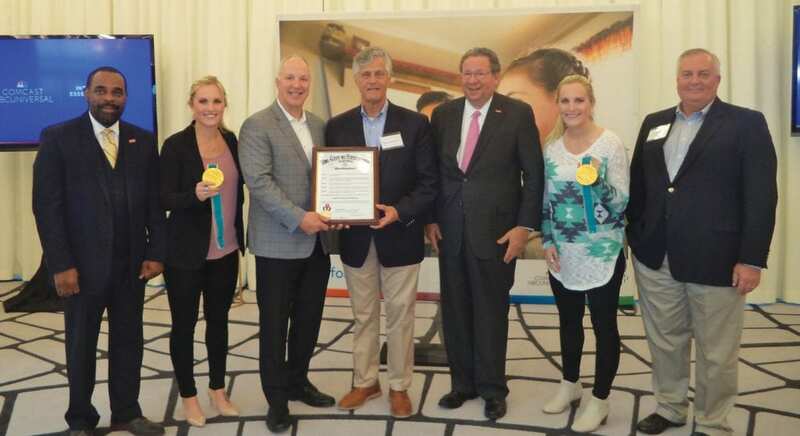 Comcast’s Cohen, and national spokespeople and U.S. Olympic gold medalists Jocelyne Lamoureux-Davidson and Monique Lamoureux-Morando, spoke at a school assembly about the importance of using the Internet for schoolwork. Cohen and the Lamoureux twins also joined Savannah’s top female entrepreneurs and community leaders at a women’s luncheon at the DeSoto Hotel. The twins spoke to the importance of women advocating for access to resources and pay equity. Attendees also learned about the partnership with Family Promise of Greater Savannah. The agreement will involve teaching life skills training and coding based on the curriculum of the national “Girls Who Code” organization, to a select group of students from Savannah-Chatham County Public Schools.